This is an 18-inch balloon at the end of its filling cycle. Due to high buoyancy of the 2:1 hydrogen:oxygen mixture, this balloon stays aloft for quite a time before slowly falling back to earth. The balloons are filled with hydrogen and oxygen generated from the cracking of tap water using RET technology. The water was at room temperature. The RET reactor used in this experiment was less than 2 inches long and 1/4 inch in diameter. 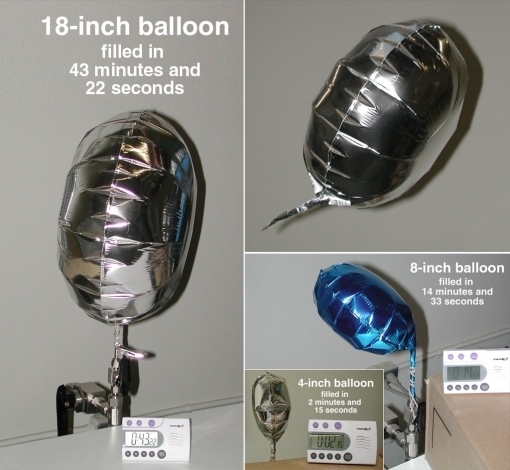 The clocks in the picture show the amount of time elapsed from starting from an empty balloon to a filled one.